Income growth is not a neat story, but technology pessimists would like you to think it is. 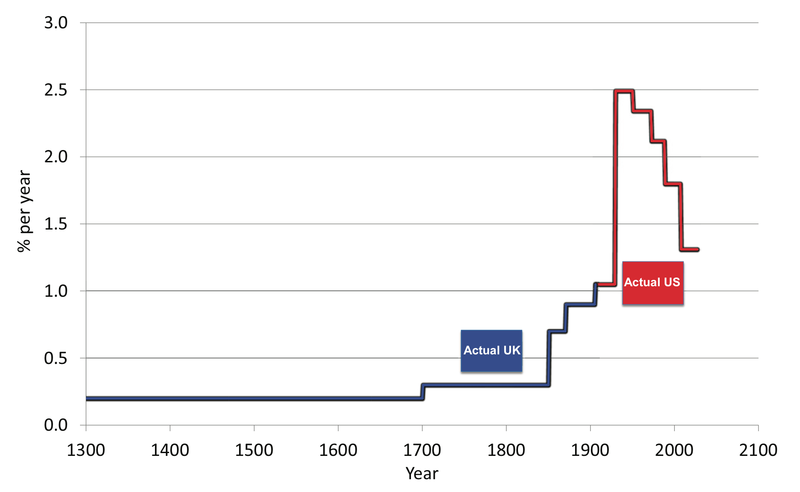 Robert Gordon provides the following neat picture of ‘Growth in real GDP-per-capita, 1300-2100’ (here or unpaywalled summary, here). The end-date alone should be enough to make us realise that this is a stylised representation, at best (and the 2008 onwards data is purely imagined, a ‘provocative fantasy’ in Gordon’s words). But even with that caveat it is a highly selective and misleading representation of growth. A growing number of economists, looking at the data on productivity and incomes, are wondering if the technological revolution has been greatly overhyped — and some technologists share their concern. Like so many economic debates, I think the side you fall on has more to do with your innate disposition than a fair reading of the evidence, and so I should begin by declaring mine: I just don’t believe this hypothesis: at heart I’m a techno-optimist, and I’d need dramatic evidence to change my mind.